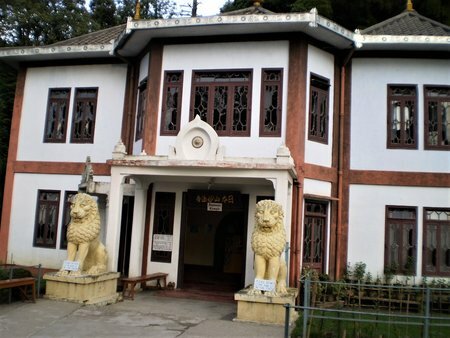 There is a wonderful Japanese temple located at a 10 minutes driving distance from the Darjeeling town center. The temple is also known as the Nipponzan Myohoji Buddhist Temple. The two storied white building was built in a traditional Japanese style in the year 1972. Close to the temple is the Peace Pagoda that showcases four avatars of Lord Buddha. From the top of the Pagoda, you get a panoramic views of Darjeeling landscape including the Kanchenjunga range. As you enter the temple, there is picture of the founder Fujii Guruji. There is also a model of Buddha suggesting that it's a Buddhist religious temple. Fujii Guruji was the founder and preceptor of 'Nipponzan Myohoji', a Buddhist order for world peace. He was a close associate of Mahatma Gandhi and had seen the tragedy of atom bomb in Hiroshima and Nagasaki in 1945. Walk up the wooden stairs and you will reach the large prayer room upstairs. The prayer timings are from 4:30am to 6am in the morning and again from 4:30pm to 6:30pm in the evening. If you can time it right, you can also join the prayers and get an opportunity for introspection and feel the divine peace the temple offers. I had that opportunity once. 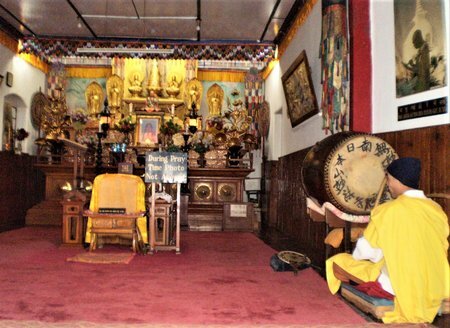 In the prayer room you will see the present Guruji or the chief priest offering the prayers, beating a huge drum (also known as Ho-ko) from which a reverberating sound originates that fills the entire temple premises. The humming sound and the chants add to the solemn atmosphere. As you enter the room, you will be invited to sit and join the prayer. A small drumming pad and a stick will be given to you so that you too can drum in the same rhythm. I was amazed how such a small pad too can generate similar resonating sound. You can leave anytime you want. On your exit, you will be offered small sweet balls that represent the deity's blessings. While photography is allowed inside the temple, it is prohibited in the prayer room when the prayer is going on. Close to the temple some 100 yards away is the Peace Pagoda. The foundation stone of the Peace Pagoda was laid on November 3, 1972 by Nichidatsu Fujii and it was subsequently opened in November 1, 1992. According to the Lotus Sutra, the very appearance of the Peace Pagoda is an embodiment of Lord Buddha that radiates peace and non-violence. It purifies the land as well as the mind and soul of the people. The first Peace Pagoda was built in Kumamoto, Japan, in the year 1954 by Fujii Guruji. The Peace Pagoda here showcases four avatars of Buddha. This is the tallest free standing structure in Darjeeling. It's height is 28.5 meters and diameter is 23 meters. As you climb up the stairs in the Pagoda, you will see two concrete models of lions on two sides at a lower level. The avatars of Buddha are all large statues carved in the walls and polished in gold color. The Peace Pagoda was designed by Dr. M Ohka of Japan and took three years to construct. Take a walk ('Parikrama') around the pagoda at the pinnacle. You will see beautiful artwork etched on sand stones that look like wooden framework depicting the life of Buddha and his relics. There are mythological depictions like 'Gift of Mango Grove by Amrapali at Vaishali' and 'Great departure of Siddhartha'. You will see the four avatars of Buddha during the Parikrama, that includes Buddha's postures such as sitting, sleeping, standing and meditating. From top of the pagoda you get wonderful views. Straight down you will see the Japanese Temple at a distance. Behind that there are rows of pine trees. As you look around to the left, you will see the mountain range. On a clear day, the snow peaks are clearly visible from here. The temple open hours is from 4:30am in the morning up to 7pm daily. There is no admission fee. Prayer timings are from 4:30am to 6am, and 4:30pm to 6:30pm. There is a toilet below the temple. However over the years I have noticed that it is not well maintained and often remains virtually unusable. 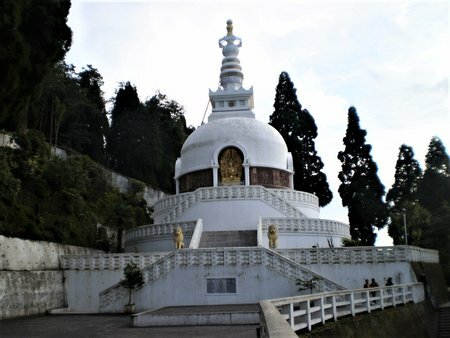 Japanese Temple & Peace Pagoda are located at the Jalapahar hill area. 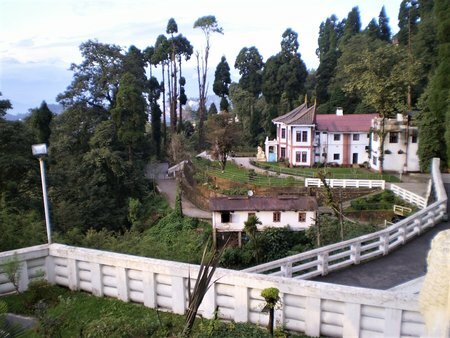 It's about 10 minutes by car from the center of the Darjeeling town. Check out Darjeeling Map to see the location.